Specialist analytics and financial technology firm Real Estate Foresight today announced an expanded service that will benefit foreign investors who want to gain unique, independent and data-driven insights into a USD 1 trillion market for new homes sales in China. "The nature of the game in China property markets is increasingly about finer market selection down to sub-district level, and product differentiation - in response to richly supplied markets and growing role of demand from more discerning upgraders," says Robert Ciemniak, the CEO & Chief Strategist of Real Estate Foresight. The company's goal is to support foreign investors and fund managers with the essential tools and analysis to compete in such environment. Real Estate Foresight combines data science with primary research, working with clients such as Century Bridge Capital and Starcrest Capital Partners, who value an independent and more 'scientific method' in assessing opportunities in their investment process. "As the Chinese property markets mature, access to data and superior analytics are becoming more important than ever", says Tom Delatour, CEO of Century Bridge Capital, a US based firm specializing in the China residential sector. Major new additions to Real Estate Foresights' China Forecast service include CityScreener™ reports and Quantiviable™ online analytics companion, focused on finer assessments of cities and districts across China and complementing a suite of monthly analyses published by Real Estate Foresight. China Forecast service: an introductory 1-minute presentation. Getting and interpreting data is hard in China. Setting up predictive models based on the data takes true expertise, which Real Estate Foresight has been building and refining. Real Estate Foresight sources underlying information from data partners, including Beijing-based SouFun - China Index Academy, to build analytics based on best available data. 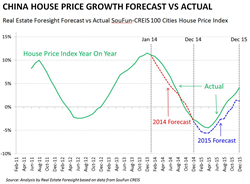 Real Estate Foresight has an excellent track record in forecasting the growth in China house prices over the past two years (click here for the chart). Real Estate Foresight is an independent analytics, research and financial technology firm based in Hong Kong and established in 2012. Combining data science with primary research, Real Estate Foresight helps foreign investors and fund managers assess opportunities in real estate markets focusing on China. Services include the flagship China Forecast monthly research program, as well as bespoke market studies for due diligence and operational project decisions. Real Estate Foresight can provide truly independent views as the company is not involved in any brokerage, trading or fund business. Visit http://www.realestateforesight.com and http://www.quantiviable.com for more information, stay connected @reforesight on Twitter, join our distribution list for Monthly Briefings.